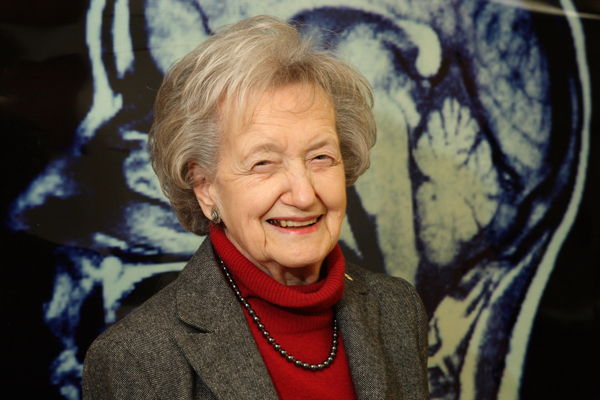 Brenda Milner, an active researcher at the age of 95 at the Montreal Neurological Institute and Hospital (The Neuro) is a recipient of the prestigious Kavli Prize in Neuroscience for 2014. The Norwegian Academy of Science and Letters also announced Thursday winners in Astrophysics and Nanoscience. Milner shares the Neuroscience award with two other researchers. The Neuroscience prize is awarded for outstanding achievement in advancing understanding of the brain and nervous system. Milner is a legend in the neuroscience world. As the Dorothy J. Killam Professor of Psychology, she is widely recognized as one of the founders of cognitive neuroscience – the field that brings together brain and behaviour. For more than six decades, her creativity and precision in studying amnesic and other patients have led to conclusions that radically changed the way we think about memory. Milner’s research has also had a profound influence on the development of tests to treat people with brain disorders resulting from traumatic injury and degenerative diseases, and from psychiatric illness. The Kavli Prize consists of $1 million (U.S.) in each of the scientific fields. In addition to the prize money, the laureates receive a scroll and a gold medal. The Kavli Prize is awarded every second year by The Norwegian Academy of Science and Letters. This year’s prizes will be awarded on September 9 in the presence of His Majesty King Harald. The ceremony will be hosted by Alan Alda and Haddy N’jie. Principal Suzanne Fortier was delighted at the news. “Professor Milner’s rigorous studies of amnesic and other patients transformed the way we think of memory. The Kavli Prize in Neuroscience is a wonderful honour for Dr. Milner and recognition of a lifetime of dedication to understanding human cognition,” said Guy Rouleau, Director of the Montreal Neurological Institute and Hospital of McGill University and the McGill University Health Centre.